Just recently bought a new to me 93 Sonoma with a 2.8 fuel injected 5 speed and it keeps throwing a code 15 on and off. I noticed the previous owner has replaced the sensor but that's probably not the issue. I've seen threads where you are supposed to jump the yellow and black wires and the gauge should go full hot but I'm not sure if that's for full size trucks only. Either way, it doesn't move the temp gauge on the dash if I do that. Not sure if they are actual gauges or that wonderful idiot light style gauge GM loved in the late 80's and early 90's. If there's anyone who has encountered this issue, I'd be very grateful for some direction. Thanks. Alex. 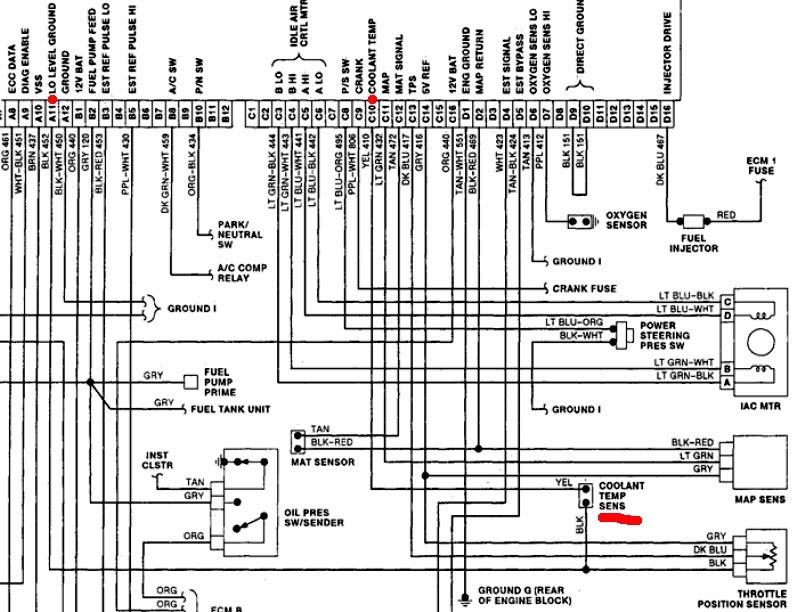 DTC 15 on an OBD1 is either a defective sensor or an open circuit in the sensor wiring. Look carefully at the connector. I had one that was all corroded inside and not making contact. If it looks OK follow the wires to see if one is broken somewhere. Check for continuity with the battery disconnected between the yellow wire on the connector and pin C10. Then check the black wire to pin A11. Don't believe the PO. He might have replaced it with one from a junk yard or trash can. Sellers are like politicians, don't believe a word they say. New sensors are $10-15. You can test the sensor with a DVOM. If it's reading between 1000 to 20,000 ohms, it's probably alright depending on what temp you tested it at. If it's under 100 or over 100K then it's likely bad. God bless you sir...been looking for a decent schematic. Ok...continuity test was successful. I was able to find a parts store that had a nice OBD1 scanner that gave me a data read out. I had the temp sensor plugged in (mind you I just drove 15 minutes to get there) and it read -40. I then jumped it and the read out went to 392. This tells me the ECM must be working properly so I bought a new sensor. I'll install it later once it cools down and report back. If this doesn't fix it, I have NO clue where to go next..hahaha. The temp gauge sensor is in the cylinder head. From what I've gathered, the gauge temp sensor and the ECM coolant temp sensors are 2 different things. Please correct me if I'm wrong, I really don't know OBD1 stuff very well. I replaced the ECM temp sensor and it does the exact same damn thing.... I'm lost. Like Hoosier Rick said...Sensor for the temp gauge is in the driver side head. Did you replace that one? It probably has a different plug configuration than the other one, so make sure you get the correct sensor. Take the old one with you to the parts store. The gauge has nothing to do with his problem of a DTC15. He said he was working with the sensor with a black and yellow wire. That's the ECT sensor. The gauge is a single green wire. If the wiring is good and the ECT is good, it's the ECM. Well ****.. I'm no stranger to electrical repairs, is there a common DIY ECM repair that I can do myself? Broken solder joint or bad resistor??? Not that I'm aware of. You should have the 1228062 ECM. They were on other similar GM vehicles in that era. Might try boneyards or ebay for one. You need to swap in your chip to retain you particular program. 8062 came on these vehicles depending on the engine. I'll look in the barn tomorrow and see if I have one in my stash of ancient artifacts. Think most of mine were 7747 from my TPI days. I have heard of them being substituted, but sometimes needed the A/C signal re-pinned. Wouldn't try it w/o the wiring diagrams for both. I agree with your diagnosis so far but I would still carefully inspect that connector for damage where the wire enters the CTS connector body, and I'd probably either replace that connector or at least re-pin it (Weatherpack pins and seals are cheap and easy to get -- Amazon, etc. have them and you should be able to find them locally). I would try that before I replaced the ECM, but it could be an intermittent issue in the ECM itself. jwvess FOR THE WIN... Not sure which one of the repairs you suggested worked but I did both, replace the pigtail from one out of a junk yard truck, and add some solder to the exposed ground wires at the back of the head. I also gave the bolt a little tighten for good measure. All this has netted a 0 ses light for the last 7 or 8 drive cycles. Thank you guys very much for the support. Alex. Thanks for letting us know that you fixed it and what the cure was. "Look carefully at the connector. I had one that was all corroded inside and not making contact." The CTS and the TPS are grounded to the ECM with the black wire at A11. So the ground on the head has nothing to do with it unless the ECM wasn't properly grounded, in which case you would have had additional issues.